Whenever I discuss anything about India, people site excessive population as the core cause of almost all the issues faced by Indians. I always try to make a case as to why I think having a huge population might work for our benefit if its potential is utilized effectively. Let’s see how we match upto China and US, the other top countries in terms of population. One of the advantages of having a large population means huge consumer base. With approx. 1.180 billion consumers almost all the multinational companies are looking to tap on India’s population. The telecom sector is the biggest example of consumer’s growth. India added one French wireless market last quarter or one Canadian market every month in last quarter. Imagine what would have happen with a relatively small population? Because of a huge population we still are in growing mode, that would mean still a lot of our population have to be urbanized. 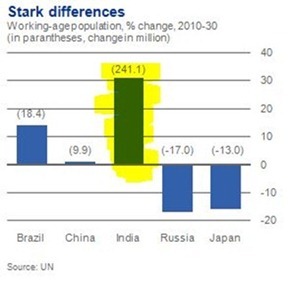 In rate-measures, India is catching up with China although only 30% of our population is urbanized. One might wonder why urbanization is a good thing for India. Unlike many other countries that are grappling with aging population and rising dependency ratios, India has a young and rapidly growing population in the world. That would translate into more additional workforce per year. To put into perspective with China, India will add more than thrice the workforce at a growth rate of 1.6% per annum by 2025. There are numerous other merits which I may list but you get the point. Why am I emphasizing on the merits is because hopefully we will begin to see that mismanagement of population and not the population is the problem. Indian government should step up and utilize our population and see it as a potential demographic dividend. "Population: Root of all our problems or a blessing ? ", 5 out of 5 based on 1 ratings. There has already been a discussion about corruption and i have already said that corruption is not affecting us economically but only morally by the way do you know that Enron and Banking scandals alone in US is almost 10 times more than India has ever experienced in Corruption.By the way Suresh Kalmadi bungling in CWG is more about Incompetence rather than corruption the supposed total value of corruption in CWG is around Rs 29 Crore barely material. Almost every single American senator gets hundreds of’ millions in campaign funds through the so called “Corporate Lobbyists” What is illegal in India as Corruption is legal in the United States as Lobbyists Every single staff in the US Congress has a lobbyist among them. India does have a corruption problem but certainly relatively not rampant than any other country in scale. Moreover as i have said in the previous topic on corruption ,there is more value for money in the hands of the individual rather than in the Hands of the indian Government. Excellent comment. In fact in my view the ideal population for India should be around 250 millions (best case scenario) and 400 million (at the max). Balaji is disappointed that we already crossed the limit and game over. We can however turn the tide over. By gradually reversing the trend. Thats what I meant when I said it will take up to 3000 AD. Also we should encourage Indians to settle abroad like Philippines. They are the leaders in this game. They push as many philippinos to any country they wish to go by encouraging them with passports (second passport also if it is requires). This has two benifits. It This will take care of about 10% issue the rest has to be managed inhouse. It will take an Idiot to say that India’s population is a blessing.Cant understand Altafs comments here. Indias ideal population according to me is around 300-400 Million as India has enough fertile land to feed them.But 1.2 Billion is just way too much to manage. If we had to started our growth story when we had a population of 200-300 Million and then we could have saturated our population around the desired 300-400 Million but India’s real growth story started only from 1992 when Indias population was around 850 Million or even more.So we are already 700 Million in excess.Whats the use of having a young population who are not going to find a decent job anyway and no resources to sustain them. Our population is not only creating problems for us but also to the world as it leads to rampant exploitation of natural resources and even excessive farming will affect the fertility of the soil.Cause even after the projected Urbanization only 600 Million will live in cities which means that we are destined for Maoist violence for the next 60 years. Population was,is and will be the single most important factor for all our problems.To illustrate i will just tell you a fact ,India has managed to create a consumer class of 300 Million within 10 years from the initial 60 Million in 1992 If the population hasn’t grown from the initial 350 Million in 1947 we would have become a poverty free country and our per capita income would have been equal to some of the developed countries of the world . I dont want to stress too much on any issue accept put again my twopaisa on two points. 1) Ravi said, there is not a single company which knows how many heads they gonna require next year. US, Canada give preference to few professions while applying immegration rules. Why? They know they are in short supply. What I am saying is unlike in maths, we may not know exactly how many heads but a vaguely close figure can be arrived and can be worked on as to how many engineers, doctors, accountants are needed. In lighter vien, Regarding politicians we should do with less of them. This way the race of politicians will become extinct. A mutent race called administrators will evolve and take over the role of politicians. 2) I dont understand the discussions in many forums and articles about the age of the nation. If you are a small family of two parents, two kids, you can say that the age groups are two. One group is in 40s or 50s and the other group is in 20s. No one is in the group of 80s and no one is in the group of toddlers. When you increase the no of ppl in the family to lets say 100 or 500 or 1000, many new groups will come into picture like toddlers, teens, group of ppl in 30s, 40s, 50s ……….. till even 100s. So what I am saying is that when we talk about population of countries, I am sure each age group is equally represented. I mean if there are 100 age groups (ppl with age below 1 yr, ppl with age between 1-2 yrs etc till age above 100) the whole population is equally divided among the groups. What I am saying is that if indian population is 1.2 billion and if we classify them in 100 age groups we have 12 million ppl in age group of less than 1 yr age. We have 12 million ppl within age of 1-2 yrs. Its like same tossing a coin. If u toss it once, you have either head or tail 100%. the otehr result is 0%. As you increase no of tosses to 100, you have “almost” 50% heads and 50% tails. Every now and then govts do some policies which alter the % of age groups slightly (like we say we have young age group now) but after 10 yrs, the young lot is going to age. So we can not alwaqys have higher % younger lot. So it has got nothing to do with govt policies. Even china is now may be saddled with senior setizens. 10 yrs later, they will attain nirvana and the age average will come down. But theoritically we can maintain higher young population continuously. Give birth to more kids than those who die. As we have higher and higher kids coming into the world, the % of young is kept higher. But I dont think its a good idea as population increases at faster pace. Great use of brain power to create an ideal situation analysis. The fact is the world is not ideal. India doesn’t do too much about its exploding population. Is it problem? Well, seen from the point that due to the non-action of the govt. over the decades, we now will have a youth population for another 3-4 decades which can generate huge wealth for the nation. China went ahead to control the population and imposed a one-child policy. The effect is that now they have an aging population compared to India, no social security like the western world or Japan, and so the aged Chinese people will neither have govt. help (social security), nor multiple children like in case of India! There should not be an apologists for population growth. These are all false propaganda spread by capitalists. Such ideas are very dangerous for the survival of the human race. We have to take into account ecological considerations, water, land, natural resources and the perpetration of the human race. A Tfr of 1.5 to 2 is ideal. There is no use of having billions of people who cannot contribute. A small , well-educated population is good. Population management is the key . Hey Sujay. I appreciate your opinion but at the same time I look at Japan and other western european countries (and to US as well to some extent) and I see the growth has halted. Part of it is because they have small population, which apparently is well-managed. While you are right when you say population management is they key, yet I would think having a diverse sizable amount of population is better than a small population. When ever I read any news paper or magazine or any website, most of the articles are related to polulation. (Either excess in India or decreasing population of developed countries like Japan, Taiwan, Finland etc and their related social problems). This made me think, so what is the perfect population density? It varies from country to country. As an Engineer, we learnt that when you design some equipment we use the input data to design optimum capacity equipment. Similarly when we calculate backwards and ask the question, how many people can a country-India wwith all its resources support? Step 2 : Consider all the rivers, sub rivers, their tributeries and calculate how much water is available in a year. Calculate 75% of that quantity as reliable water availability. Out of the arrived figure, 80% is to be used for agriculture and balance 20% left to go to the sea. Step 3 : Now that we know how much we have agricultural land, we know how much we produce food grains/veg oils/vegitables/sugar atc. Step 4 : As we know how much we produce in food, we can easily calculate how many people such food supports. Step 5 : As we know India’s designed population capacity, we know how much social requirements are there. Like we have international standards of X doctors per 1000 ppl, Y police per 1000 ppl, Z teaching staff per 1000 ppl. So on so forth. We can calculate everything related to administrative manpower that is required for our designed population. Step 6 : As we know the designed population, we know how much steel, cement, electricity, water, roads and all kinds of infrastructure required for our designed population. Taking forward the calculation, we need the employees the infra sector can support. That means we know how many engineers we need, how many technicians we need. Now suppose we arrived at a figure of 1 lakh engineers required. Suppose each engineer works for 25 years and retires, so we need to replace the retiring engineers. So every year we need to replace 4000 engineers. This way we also need how many engineering collages required to suppliment the retiring engineers. Same can be applied to doctors, lawyers, any profession and can work out how many collages required. Step 7 : Service sector : You know from developed countries, how many heads required in service sector per 1000 ppl. (Like tourism sector, IT sector, banks, etc) So you know how many employees you require to serve our designed population. Step : 7 Now that we know how much is India’s designed population. We know how much agricuture so we know how many ppl in farm sector (including dairy, fisheries and anything that you can think off). You know how many ppl in infra industry. So you know how many total jobs you can create to support our designed population. I hope the total designed population matches with the requirement so that we can live in harmony. Same way every country has to make its own design. There are lot of differences from country to country. For example Indian calculations dont apply to Saudi Arabia though land mass is almost equal (70%) as most of the nation is desert. Once we design the whole globe, we know where to increase population, where to decrease. It is a very huge excersize and if we take it up now, we may complete it by 3000 AD. I always try to look at any issue from bird eye view to have balanced idea of solution. Most people who know me consider I am a nut case, which is OK with me. Its OK with me, if this above write up has given amusement to some, or given some logical thought to some or boredom to some. Its OK with me. There should not be an apologists for population growth. These are all false propaganda spread by capitalists. Such ideas are very dangerous for the survival of the human race. We have to take into account ecological considerations, water, land, natural resources and the perpetration of the human race. A Tfr of 1.5 to 2 is ideal. There is no use of having billions of people who cannot contribute. A small , well-educated population is good. Population management will be the key . @Altaf, Thanks for your valuable inputs. I have to admit that I completely skipped the core of your comment so pardon me for that and please elaborate on what is the central learning of the comment. True in an ideal world! But in my opinion the model is based out of assumptions that everything is going to be perfect. So people living near forest(33% coverage!!! wow!) would leave it untouched. Step-7(service sector), forget about countries, I havent seen 1 company who knows how many heads they require for next year! Am I a capitalist(yes and a big one!) but I dont get the point of your comment. I mean like you said its not possible to do it till 3000 AD. With a strong title to the post, I was hoping for a more concrete list of opportunities. Thanks Madhav for your critique. So there are a whole bunch of opportunities but obviously space is always a constraint. It would be great if you could point few others.